What is a Health Retreat? What Happens on a Health Retreat? What are the Benefits of a Retreat? Why Did I Choose Amchara? A health retreat. What does it bring to mind? A tranquil withdrawal from your frenetic lifestyle for a short while, giving a chance to rest, regroup and rejuvenate? Or do you connect retreats with bland, restrictive diets, denial of luxuries and treats, dullness, boredom and basically no fun at all? Health retreats promise mental and physical benefits from detoxification and personalised nutrition in a stress-free environment. I recently had the chance to find out, courtesy of Amchara. I qualified as a Nutritional Therapist almost twenty years ago and I’ve been coaching clients towards their wellness goals on and off ever since. It’s fair to say I’m passionately interested in nutrition, but I don’t always heed my own advice. Even though I know thanks to my individual makeup certain foods work in harmony with my body and others don’t suit me too well, I often don’t eat accordingly. Despite emphasising to my clients the importance of managing stress, I frequently don’t heed my own advice. Let’s not forget our bodies change over time, so the strategies I developed to look after myself in my twenties might not be so appropriate now I’m in my fifth decade. All this has meant health issues have ambushed me when I least expected them. There was no getting away from it, the time was right for a detox. You may be asking at this point, what is a health retreat? The first thing to point out is it’s different to a spa. A spa break brings to mind luxury and pampering, lots of whirlpool baths, indulgent massages and beauty treatments. A retreat is far more health-oriented and holistic, but with pampering included. On a retreat, your body and mind are given an opportunity to rejuvenate and heal. How many times have you been on holiday only to come back more frazzled than before? With flights to catch, packing to organise and endless activities on hand to fill the day, often our time off ends up not being time off at all. A retreat can offer time to focus on an issue you don’t have time for in daily life, reflection on a recent experience or life event, or some distance from a situation to bring things into perspective. Or it can simply offer quality time with yourself. You’re provided with a serene location to simply focus on your own well-being. Clean air and calmness allow you to totally relax and rejuvenate. The nutritious food and cleansing juices provided during a health retreat will help your body to devote time to banishing toxins. Unhealthy habits can be broken. When you reward your body by avoiding unhealthy food, you’ll return home feeling positive about yourself. That way you’re more likely to make long term, beneficial changes to your approach to nutrition and lifestyle choices. Not only this, a retreat offers the opportunity to spend time with like-minded people with similar goals. Benefits of this include emotional support and objective help with identifying issues you may not have recognised on your own. One interesting study (1) looked at the metabolic responses of women who simply relaxed in a holiday environment compared with other women in the same surroundings who practised meditation. These included both women who usually meditated and those who didn’t. The wellbeing benefits of the vacation experience included improved immunity and better stress response and these effects lasted far longer in the meditation group after they had returned home. Potential benefits of a health retreat aren’t simply restricted to immune health and stress reduction, although the health implications of these will be wide-ranging. Many clients report significant progress towards their weight-loss goals. Others report improvement in digestive health, hormone imbalance, arthritis and other inflammatory conditions, as well as reduction with blood sugar issues. An Amchara health retreat appealed to me because Amchara’s mission is to inspire orientated changes in its clients - as they say 'Change for Good'. The retreat offers the ultimate personalised health experience in a nurturing, relaxing environment. I hoped my time at Amchara would help me take charge of my wellbeing goals I’d neglected over time. The retreat provides an environment where you are supported through education and empowerment. Health programmes at Amchara are tailed to an individual’s needs and goals. We are all different, so one size never fits all. Amchara’s ethos combines naturopathic principles and functional medicine and aims to tackle the underlying causes of ill-health. I’d tried detoxing before on several occasions but I’d never persisted for very long. Real life got in the way. A common concern for people thinking of attending a retreat is whether they’ll be able to keep up their good habits when they return home. Will their good intentions and motivation fade away once the supportive environment of the retreat is left behind? The other aspect which attracted me to Amchara was the concept of empowerment. Once people are given the tools to take control of their own health, changes tend to be more long-lasting. Change brings health rewards brings motivation for more change. That’s why Amchara’s mission is 'Change For Good'. My stay at Amchara was my first time in Malta or Gozo and my very first visit to a retreat. My first impression of Malta was very different to how I’d imagined. The traditional sandstone buildings lent a Middle Eastern look, peppered with impressive churches. To get to Gozo you have to travel across Malta, an excellent chance to take a peek at the island through the taxi window before the short ferry journey across the Gozo channel. 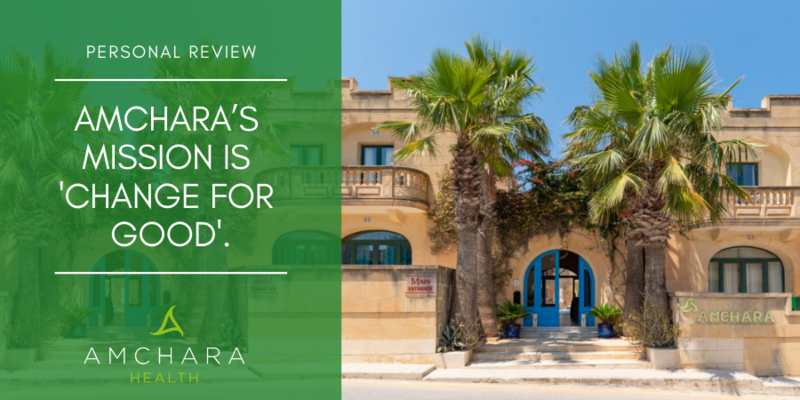 Gozo is often described as Europe’s best kept secret and I could immediately see why. It was as if the pace of life had been taken down a couple of notches. Tiny Gozo is quiet and incredibly beautiful. 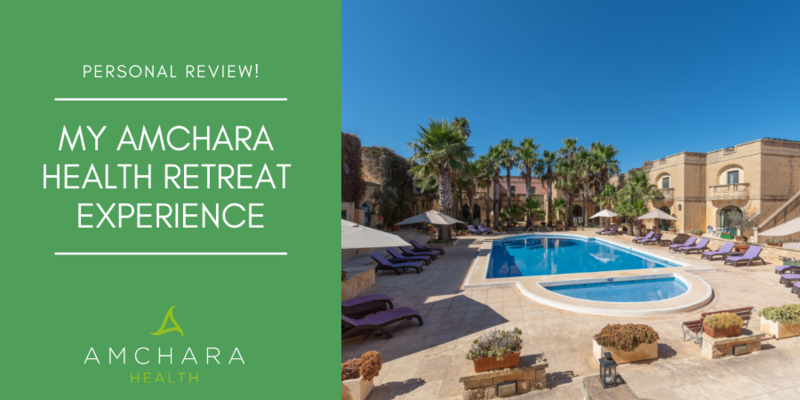 Upon stepping into the retreat I was struck immediately by Amchara’s calm welcoming atmosphere, fans turning lazily in the reception and - excitement! - the glimpse of a superbly serene blue swimming pool beyond. On arrival, I was given an initial screening to determine my goals, health conditions and priorities. My goal was to embark upon a juice fast because despite being in the nutritional therapy world for so many years, I’d never made it beyond lunchtime when I attempted to juice fast at home. And that’s the thing. It seems so hard when you’re surrounded by food temptations and a to-do list as long as your arm. Take it all away and it suddenly starts to look so much easier. The concept behind a juice fast (also known as a juice cleanse) is that by giving your body a break from digesting food, it can focus on healing, balancing the immune system and improving mental clarity. While at the retreat I knew I would be treated to three organic vegetable juices per day, one at 9am, one at noon and the final juice of the day at 3pm. Still, I did wonder how I’d get on. Would I feel ravenous? I imagined I’d feel so hungry I’d be chewing the bedcovers. As it happened, I hardly even felt peckish. Before each juice, I was advised to mix a little psyllium husk in water and drink it down. I was told this would help keep my bowels moving, but it also had the added benefit of filling me up. Juice ingredients included cucumber for cleansing, beetroot for liver support, carrot to aid kidney function and lemon to alkalise. I found them delicious, and as I sipped them I felt very virtuous! 6pm was the time for a vegan potassium-rich broth which was surprisingly tasty. There’s also the option of delicious and therapeutic shots to have alongside your juices. Amchara offers an inspiring menu of shots including immune-supporting reishi mushroom, turmeric, spirulina, wheatgrass or Maca root. I opted for Maca as I knew my adrenals needed a little support, as well as turmeric to ease inflammation. Because the nutrition plans at the retreat are personalised, clients who weren’t juicing were enjoying soup, smoothies or organic, raw, paleo vegan food. This is prepared by Amchara’s own therapeutic chefs. At the end of the first day and wondering where my hunger pangs were, it did seem a long time until the next morning’s juice. I needn’t have worried. Despite having suffered from broken sleep for the previous few months, that night after a yoga session I slept like a baby. The great thing about the retreat at Amchara is you can do as much or as little as you choose. 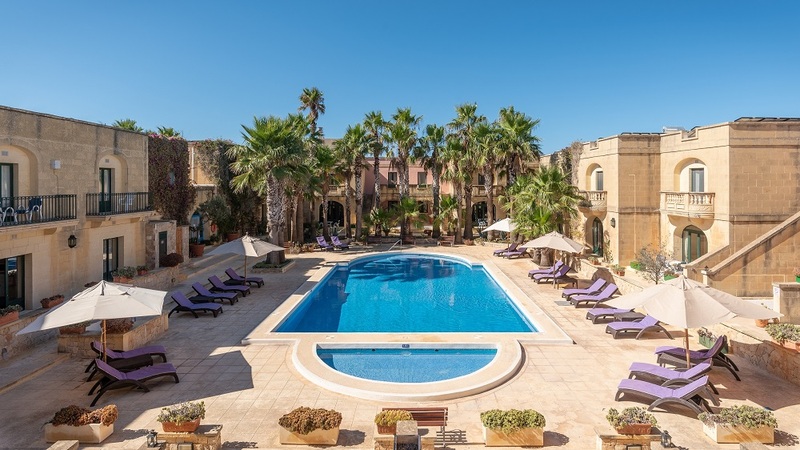 There’s lounging by the pool of course, but also on offer are morning walks around the gorgeous coastline just five minutes from the retreat or into the small town of Gharb in the early evening. There are also beach trips and a range of educational talks. At the retreat, clients can choose from a timetable of both relaxing and invigorating yoga sessions, meditation and aqua aerobics. In the wellness garden, I took advantage of the jacuzzi as well as the far-infrared sauna. As its name implies, this sauna uses infra-red panels which operate at a lower temperature than a traditional sauna. This allows more of the heat to penetrate the body, and it’s more comfortable to stay in the sauna for longer and so reap the benefits of improved detoxification, easing of muscle soreness and reduced blood pressure. There was also a steam room where I happily sweated out my toxins. Clients can take advantage of optional massages, emotional support and NLP, colonic irrigation, coffee enemas or one-to-one health consultations with an Amchara naturopath to further explore their personalised health journey. I was given a heart rate variability (HRV) reading which measured the rhythm of my heart rate to inform me about my personal response to stress. The results were fascinating and told me what I intuitively knew to be correct - I need to meditate more. There’s also the option of a neat test called a Thyroflex which uses the speed of our reflexes to accurately assess thyroid function. I opted for a lymphatic drainage massage which is a great aid to detoxification. The lymph system relies on our muscles to keep it moving, so when we sit for much of the day – for example typing into a laptop – our lymph system can become sluggish. The atmosphere at the retreat was unquestionably one of acceptance and support. We were all there for different reasons. Some were there to improve physical health, some for much-needed head space, others to lose weight, and for some, it was an annual thank you gift to themselves. We all had something in common - we all wanted something to change. Whatever our goals, we were all supported every step of the way. Sadly it seemed as though my time at the retreat was over almost as soon as it had begun. Despite being a self-confessed foodie I felt so energised, lighter and clear-headed on the juices I didn’t really want to stop. After I’d broken my fast with an organic apple the lovely staff at Amchara waved me off with a super packed lunch of tasty raw food and I stepped out of the retreat feeling greatly destressed and recharged – ready to take on the world. Would I recommend a health retreat such as Amchara? Absolutely. The great thing about a health retreat is anyone and everyone can take part because it can be tailored to suit individual needs. I found my retreat experience the perfect way to reconnect with healthy habits and leave my troubles behind. Have I taken these habits back home? Definitely. But I still can’t wait to visit again. Have you been to a Health Retreat? We’d love to hear about your experiences, get in touch!